This interactive presentation contains the latest gas production data from all 7091 horizontal wells in Pennsylvania since 2010, through November. Ohio data through September is included, though by default deselected (use the “basin” selection to include it). Total gas production increased with almost 1 Bcf/day in November. Fewer wells were inactive, and the wells that started in October had a good 2nd month on production. In the last tab (“Top operators”), we can see that Chesapeake, after making a multi-year low in October, showed a significant rise in gas production in November. You can see that the wells that started in 2015 (blue) are so far tracking the performance of 2014 (orange) vintage wells quite closely, on average. These wells display a significant improvement over the earlier wells in this basin, not only in initial productivity, but also somewhat in the decline rate afterwards. If you wish to see the performance of more recent wells, you can set the “Show wells by” selection to quarter or month of first flow. The reason that 2016 vintage wells aren’t shown here is that a group of wells is only shown once they’ve all gone through the same number of months on production (and production data for 2016 December wells is not yet in). This method makes sure that these curves don’t change once new data becomes available. I’ll post an updated “Projections” presentation in the middle of February, in which the projected output of all the horizontal wells I cover will be shown, from the second half of 2016 onward. 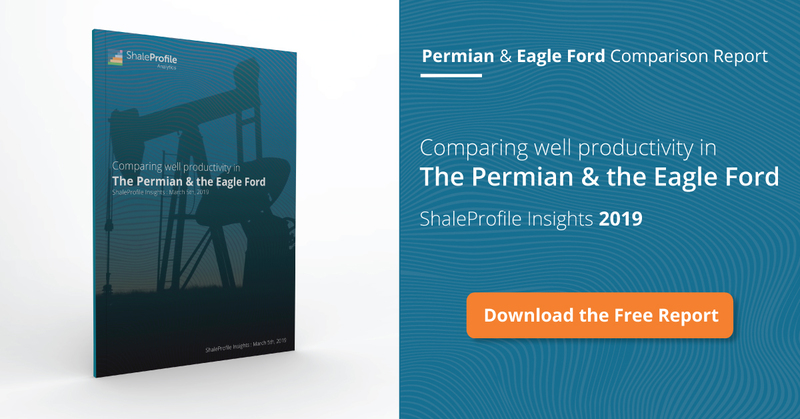 Next week Friday I plan another post on the Eagle Ford, followed by one on the Permian. This is a great body of work that you are compiling and , once again, I thank you for your efforts. There continues to be an increase in takeaway capacity from the Appalachian Basin via new, somewhat smaller pipelines, reversals, and capacity expansions. 2017 and 2018 are on track for much greater takeaway capacity. Although the 2016 wells were relatively small in number, their output was especially large which, when they are included in your next presentation, should be viewable. 15 and 16 wells by quarter below- the improvement is not readily apparent to me. I wonder if you know why facility constrained wells should have a rate decline? Just started working with this new tablet and can more effectively work with Enno’s data and format. If you go to the first chart, punch in ‘2016’ for year and Bradford and Susquehanna counties you might see what I was referring to earlier. At July, 2016, 66 wells produced over 376 million cfd. Five months later, in November, 124 wells produced over 1.15 Bcfd. Comparison being 5.7 MMcfd versus over 9 MMcfd. I also somewhat mischaracterized the depths of the Marcellus wells as I’ve not been tracking that closely lately. The Cabot wells on the King pad in Dimmock Township, Susquehanna county are under 7,000′ vertical depth (don’t know lateral length). The King D 4 has produced over 3 Bcf first 107 days online. Very prodigious amounts of gas. interesting change in a year indeed, Gerard! If you expand it to 2015 you also see similar variations, although the best is less than that in 2016 and worst is worse than that in 2016. Strange … I just pulled up same data (I think) and my chart is different from yours, with the most recent quarter – green line – highest yet. What I wanted to do was a more detailed look at the county level to see how many Susquehanna,Bradford, Washington, and Greene county wells fared, percentage wise, with the rest of the state as well characteristics and output vary dramatically depending on both location and formation targeted. Could be a little time consuming, but I’ll check in coming days. Regarding facility constraints and decline profiles, I’m not clear on what you are seeking. On a well by well basis, there is sufficient gathering lines for most (not all) drilled unconventional wells in PA. There are, however, some wells not only drilled, but fractured as far back as 2011/2012 that still have no gathering lines. These are/were primarily located off the best areas. Most productive Marcellus wells are about 8,000’/9,000′ vertical depth with FCP ranging from 3,000 to 4,500 psi. While it is not uncommon for restricted output to occur for optimal well management, (aka flatline production), this is more commonly seen with the higher pressure Utica wells … FCP in the 6,500 psi range in Belmont and Monroe counties OH, up to 9,000+ psi in several of the Deep Utica wells. The common observation of facility constraints is usually regarding takeaway capacity from the AB where prices can plummet below 50 cents per mmbtu (happened a few months back). In addition, as Enno’s graphs display, there have been statewide, temporary curtailments in production when prices plunged. These curtailments, openly discussed at the time by operators, were reversed when prices rose. The high production wells that I originally referred to in my comment above, were numerous wells brought online from Cabot, Range and Chesapeake with daily output running from 15 to 25 MMcfd for several months. I think Brooker’s answer below makes sense and leads to the explanation on why there is an annual change of IP — the take away/price constraints might play an issue here. Thanks for the reply coffee. My question focused on takeaway capacity constraints effects on data which Enno presents here which I think focuses on trying to quantify EUR. If you are tied say to a 600 psi interstate line and have a well that will deliver 7 Mm at that pressure, but for some reason the plant you deliver to only has room for 3 Mm, you might have 3000 psi flowing pressure. You continue delivering 3 Mm, your pressure declines until it reaches 600 psi and then rate declines. But all Enno s averages appear to represent rate declines. Always good to hear that my efforts are appreciated. I’ve chosen to show these wells by year, as it’s easier to see the bigger picture. But you can see already the performance of 2016 wells if you chose to show them by quarter or month. I’ve just changed the x-axes; now it’s a bit easier to estimate to which URs these wells are headed. For Cabot, even this increased range appears not to be sufficient for wells from certain periods. I rekon we will hear more abt “associated gas” in the liquids plays in due course. why can not shale gas companies just shut-in or limit the output from all the shale gas wells when gas prices dropped too much? actually I read an interesting shale gas production happening in China. This happened in the phase I project which output 500MMCFPD from 187wells close to the city of Chongqing. They took out initial 150 wells from from this phase I 187 wells and put them on constant production of 1.8MMCFPD to 3.5MMCFPD while letting the rest wells produce freely at from 5 to >10 MMCFPD. After 2-4 years, they found that the one producing freely at >10MMCFPD had now over 7BCF, and production dropped to 3MMCFPD already and pressure also dropped to 1/4th of the initial. 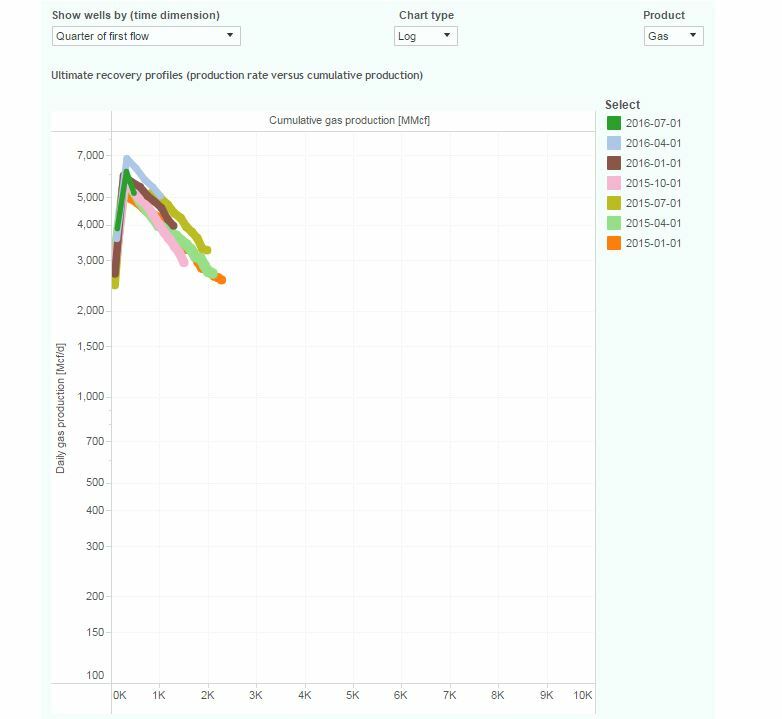 The ones producing at 2MMCFPD have been holding up the constant production level and accumulated over 3BCF now after 4 years, and the wellhead pressure still holding up as the initial pressure. I wonder if this is true for shale gas, why can not E&P companies just shut-in or limit the output from all the shale gas wells when gas prices dropped under cost.